Are you a magazine person? I’m only sometimes a magazine person. There is only one magazine I subscribe to regularly – Inspirations Magazine. 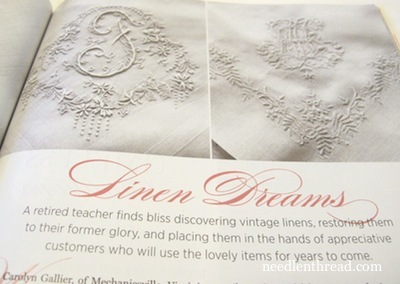 If you only ever subscribe to one needlework magazine, let it be Inspirations. It is gorgeous. Each issue is a book of fine needlework projects, instructions, and insight. Occasionally, I’ll pick up Sampler & Antique Needlework Quarterly as well. 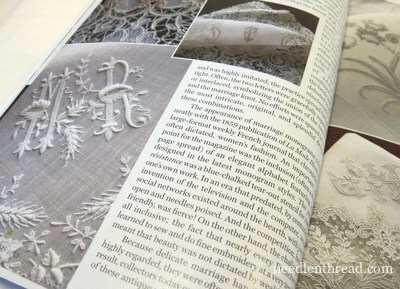 It’s a good magazine, of special interest to those who like topics related to historic embroidery. But now and then (pretty rarely these days), I come across a magazine at a newsstand or bookstore that catches my eye. I like meandering through a good magazine while sitting on the front porch, or while whiling away passenger hours on a road trip or a long commute. But it has to be a beautiful magazine – one that delights the eye and feeds the mind – and one that doesn’t bombard the reader with really annoying ads on every other page. 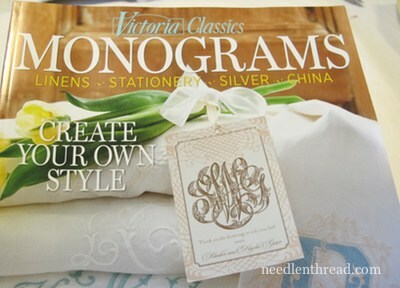 Recently, Hoffman Publishing put out a special issue of Victoria Classics on Monograms. Well, given the subject matter, and given the fact that Victoria Magazine is generally a beautiful magazine, I couldn’t resist! So here’s a review of the special issue, so that you can decide if you want a copy, too! This special edition of Victoria magazine on Monograms unfolds the world of monograms, from monogrammed linen to china to silver, stationery, and so forth. 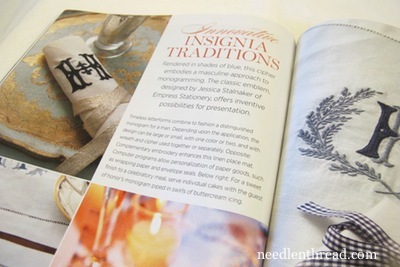 But the bulk of the magazine is devoted to monogrammed linens. Numerous articles on monograms – from their history, to the art of monogramming, to the various particular uses of monograms – fill the magazine. And accompanying the articles? Gorgeous, gorgeous examples of monograms! Everywhere! 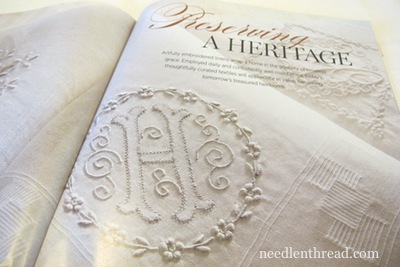 The examples of the hand embroidered monograms herein…! Oh my goodness, if you like monograms, these will make your mouth water! But the pictures aren’t the whole picture. The articles are worth reading! They will give you an appreciation for the history of monogramming, the skills involved in monogramming, the whole art of monogramming. There’s really good and useful information in here, too! You’ll find a nice reference list on the standard sizes of monogrammed table linens. You’ll learn a little bit about how monogram cyphers are arranged. You’ll find discussion on the historical significance of certain items like crowns in monograms. There are articles that focus on individuals who work with monograms today as collectors or artists. There’s just all kinds of interesting monogram-related information throughout the whole magazine! It’s a thoroughly enjoyable issue, and if you’re a lover of monograms, it’s definitely worth picking up next time you’re at a newsstand or bookstore. I bought mine last week and haven’t had time to read it but the photos are gorgeous! The INSPIRATIONS magazine looks awesome but it’s not available locally & when I looked at County Bumpkin I didn’t see a price for having it mailed to the US. Do you get the paper copy (what I prefer) or do you get the digital copy? Hi, Sandra – Yes, it is beautiful, isn’t it? I haven’t had a chance to read through the entire magazine yet, either. There are a couple articles I want to go back and linger over. I get the paper copy of Inspirations, via subscribing through Country Bumpkin. Here’s a link to their subscriber’s page: https://countrybumpkin.com.au/subscription.php It looks expensive, but if you consider what’s in each issue, it’s definitely fair. Rumor has it that they are re-introducing Inspirations to news agencies (places you can buy magazines, newspapers, etc.) in Australia – I don’t know if they are doing that in the US or not. I remember being able to buy individual copies at bookstores a while ago, but then they discontinued that for a bit. I prefer the subscription, so I don’t miss a copy. Thank you Mary. I will check into the rates for the US. Yes, our B&N bookstore gets some Xstitch, knitting and crochet from the UK but never seen Inspirations. That would be great to browse through and see if you wanted to buy one or not. Is it just me or anyone else just love a magazine and when I would subscribe they would have content I wasn’t as interested in and then I felt kinda cheated? Just the way it goes sometimes. Sandra, I have subscribed to Inspirations magazine for years and I live in the US. I get the paper copy. They will convert from Australian to US dollars for you. I agree wholeheartedly with Mary – seems expensive, but there is SO much in every issue. You also get a discount if you order kits, DVDs, etc. when you are a subscriber. Their shipping is very fast too, I was amazed at how quickly I received a few things I ordered. I adore the magazine and, like Mary, recommend the paper copy. 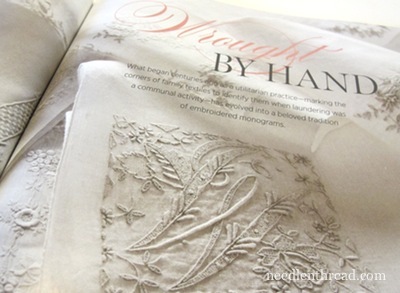 I treated myself to the Monogram issue of Victoria and the pictures stopped me dead in my tracks and I was sitting down! Monograms are one of my favorites to stitch. I could spend hours looking at one page alone. I cannot express how much I want to be that talented in producing such exquiste needlework. I thought the stories became redundant but all in all it was worth it. A valuable resource to refer to to see layout or stitch direction. I was hoping that there would have been resources/kits listed for those people who want to learn how to do monograms since it felt like Victoria was trying to rekindle the “romance” of monograms. It IS gorgeous! You know, Mary, I am finding it so interesting that at this stage in my life I am finding my way back to “old” skills. I was trained as a letter-er/calligrapher in college, and have embroidered since sixth grade. I have found your site and become interested in transforming some of my lettering to embroidery patterns, and now this magazine. It all seems, well, kismet-ic! Mary, thanks for the review. I used to subscribe to _Victoria_ years ago while obsessed with frou-frou antiques and fabrics (before I met my man’s man husband and switched to masculine leather for my own good), but haven’t seen the magazine for years. I wouldn’t have known to look for it at the bookstore if you hadn’t mentioned it (and *monograms* — such a buzz-word these days!). Can’t wait to find it and devour it again! Like you I’m only a sometime magazine person, but when I purchase a good magazine that I like there is nothing better then to browse through read and re-read them. I have a few copies of Inspiration which i continually refer to and it is really a quality magazine. The Victoria Classics looks wonderful I love the different embroidered monograms and I will definitely look into buying the magazine. Thanks so much for sharing this with us and your review on the magazine. I grabbed up this a few weeks back and posted about it here. Guess no one thought a big box hardware store would have something so intriguing. (Lowe’s) Really nice magazine, one that will be kept with my “Inspirations”. Hi Mary, I was going to purchase this but the publishing company didn’t have PayPal or similar secure payment method. Very disappointing for a professional magazine company. I used to subscribe VICTORIA 20years ago and recently started subscribing again. I love monograms very much though I was unable to decide to purchase this special issue….main reason was high shipping cost for paper copy as I live in Japan. Reviews by hearst magazines wasn’t enough for me to order, but it was really lucky that I was able to find you! Once again, thank you Mary, I will order one now!